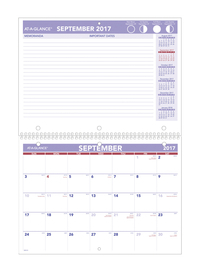 At-A-Glance Desk/Wall Calendar featuring two-page-per-month format has nearly a full page for notes with 1 ruled area for memoranda and 1 ruled area for important dates. The other page of monthly spread gives unruled daily blocks, each measuring 1-1/2 in x 1-1/4 in, federal holidays printed in red, Sunday-through-Saturday scheduling and count of days/days remaining. Three-hole punched edges along the wire binding let you fold it and conveniently store it in a binder for scheduling on-the-go. Calendar offers planning pages for 16 months ranging from Sep - Dec. Academic desk/wall calendar keeps you up-to-date from one year to the next with plenty of notes space and 4 color printing. The other elements on that page comprises moon phases and past, current and 4 future months reference.